Sunrise CSP has developed a unique approach to molten salt energy storage that is ideally suited to the design of the Big Dish and the high temperatures that it achieves. 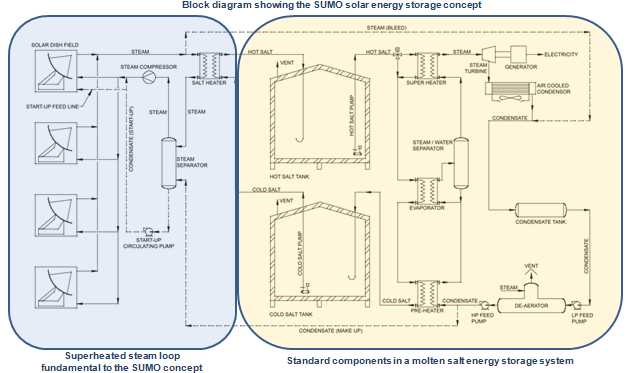 The SUperheated steam - MOlten salt (SUMO) energy storage solution allows high temperature energy transportation from a Big Dish solar field to an industry standard molten salt thermal storage system to enable on-demand and time-extended thermal energy delivery for dispatchable electricity generation and process heat solutions. High efficiency: SUMO offers the highest efficiency CSP system with storage, taking advantage of superior Big Dish optical and thermal efficiency compared to other CSP technologies, delivering a low unit cost of energy stored. Low salt volume: The quantity of salt storage required is ~1/3 of that required by solar trough plants with molten salt storage to store the equivalent amount of energy. Proven storage technology: molten salt thermal energy storage has emerged as the contemporary CSP industry standard. Protected IP: Sunrise CSP holds patents or patent applications in target markets for the SUMO superheated steam transport process. Pilot plant ready to go: A detailed design to demonstrate the SUMO superheated steam transport process with 4 hours storage has been completed and is ready for implementation. Feasibility of key components and the overall system design has been verified with suppliers during the detailed design stage of the demonstration plant.